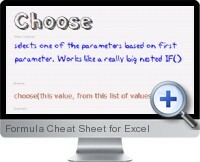 The Formula Cheat Sheet for Excel is a PDF file providing simple explanations and examples of the 75 most frequently used formulas in Excel. The Formula Cheat Sheet for Excel is designed to get a jump start on employing formulas in Excel to save time and quickly realize benefits. Instead of a complex technical information on all of Excels functionality, the The Formula Cheat Sheet provides a simple, quick and useful reference for the most common Excel formulas. Excel page of the Formula Cheat Sheet for Excel describes one formula with its syntax and two easy to understand examples. Low cost and fast learning solution. One zipped copy of the e-book in PDF format. The PDF cheat sheet can be printed and read as many times as required. Includes future upgrades to the book as and when they are released.